There's a lot of potential here and you did nicely in some regards, unfortunately, it's got some major problems holding it down. Seems quite grainy and not sharp in any area of the image. I think the lighting is just right to show off the stone and the details of the ring. Composition is pretty good as well, leading the eye a little off center to the stone. If the other elements were there, this would have a fair amount of visual pop to it. Needs to be a little sharper and perhaps apply a noise reduction filter. I really don't like to be mean but this is not a very good macro shot. It is really blurry and out of focus. I really like the way the stone catches the light. The burned out white spot at the bottom is a bad distraction. 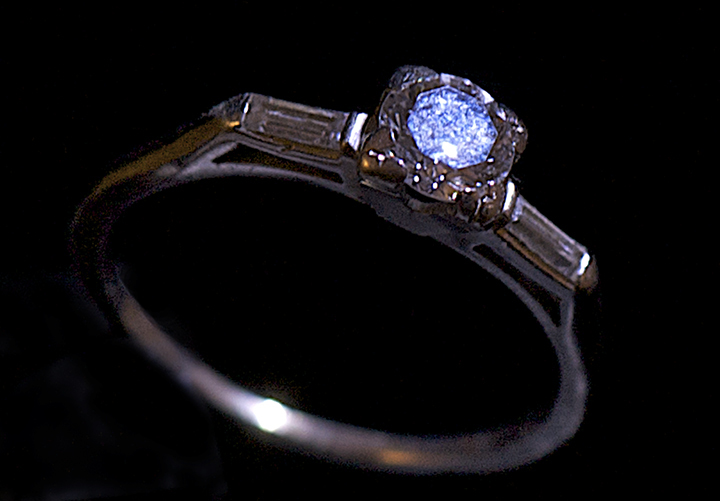 It would have worked better for me if the diamond was left in sharp focus. I even like that the rest of the ring isn't (which I usually don't). In this case it can even make a statement about the deterioration of memory and life - it is not on her finger I notice. Now it feels personal, but I overthink. Anyway good score would have been even better from me if the diamond were in sharp focus. Proudly hosted by Sargasso Networks. Current Server Time: 04/20/2019 02:23:00 AM EDT.